Experience Northern California RV Camping! 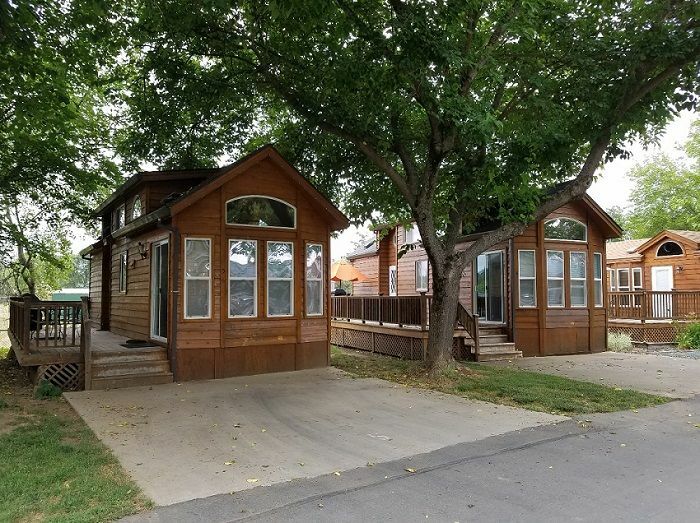 Nestled in the Sierra foothills, 49er Village RV Resort is located in Plymouth, the “Gateway to the Shenandoah Valley,” an area well known for its award-winning wineries. Enjoy a romantic retreat or bring the whole family for an unforgettable RV experience or stay in one of our gorgeous vacation rentals and enjoy a full amenity package that includes two swimming pools, a relaxing spa area, volleyball and shuffleboard courts, catch and release fishing pond, on-site dining and much more! Our studio rental can accommodate a maximum of two guests. This is a studio style room with a full size bed, a full kitchen and full bathroom. All cookware, eating utensils, and linens are included. Our one bedroom cottages can accommodate up to six guests if the sleeping loft is utilized. There is a queen sized bed in the main bedroom, a full size sofa sleeper in the living area and a full size bed OR two twin sized beds in the sleeping loft. Other features include a fully equipped kitchen, full bathroom, and a gas grill. All cookware, eating utensils, and linens are included. Sleeps six guests with Queen in each bedroom and full sized sofa sleeper in Living Room. No smoking in rental units. Please ask about our pet policy.